Remember the Smurfs? Well, they're back! Jokey has a gift for you, but you might want to be careful when you open it! This cute Jokey with Present Collectible Figure stands approximately 2 1/4-inches tall, so you can take him with you wherever you go. 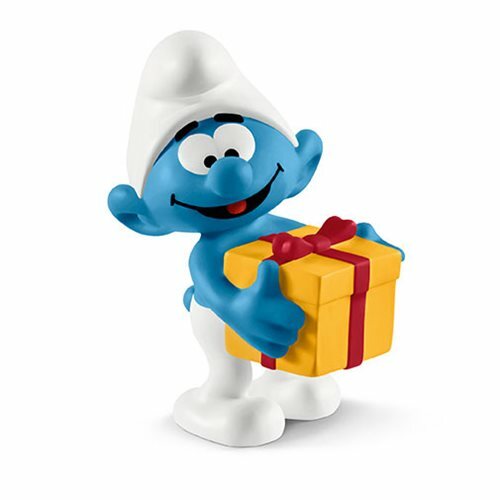 For even more fun, collect and play with all the finely detailed Schleich Smurfs Collectible Figures. They encourage children to play and learn at the same time! Each sold separately. Jokey likes to play tricks on the other Smurfs. He enjoys giving them a gift that blows up in their face when they open it! Most of the time, he's the only one who laughs at his jokes, and if for a change the other Smurfs play a trick on him, he's quickly offended.